Among my favorite fall movies is The Male Animal (1942). It stars Henry Fonda as English professor Tommy Turner, a man whose quiet, ordinary, academic life is turned upside down in a single, whirlwind weekend. 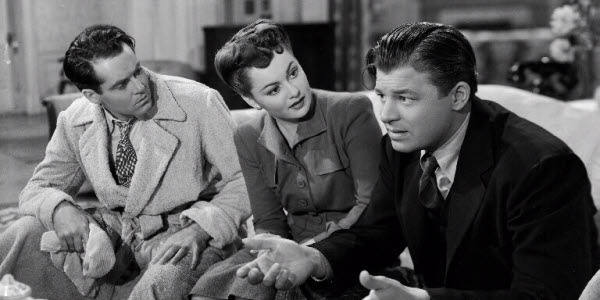 First, it's the weekend of the Big Game, and Tommy's wife, Ellen (Olivia de Havilland) is a little too thrilled to see her old college flame, football star "Whirling Joe" Ferguson (Jack Carson) at the homecoming rally. Then there's the tense political climate felt by all the Midwestern University faculty; three of their own have been recently fired for their alleged Communist sympathies. And finally, Tommy's favorite student, Michael Barnes, a nerdy reactionary, has written an editorial in the school paper announcing that Professor Turner is the one man willing to stand up to the bullying tactics of the board of trustees; he'll do it, Barnes writes, by reading a letter to his class penned by convicted anarchist Bartolomeo Vanzetti. "The hounds of bigotry and reaction," in the form of the university's trustees, come down hard. Every year I queue up this film because of the nostalgia I feel for a midwest autumn. I love the piles of burning leaves in the street. I love the excitement surrounding college football. I love the sweaters and tweedy skirts and saddle shoes worn by the coeds. I love Tommy Turner (my first crush on an English professor). And every year, I am reminded as I watch of what an important movie it is for a thousand deeper reasons. I recently penned a guest post for The Zesty Digest about Tommy Turner's turmoil in what turns out to be a debate about the freedom of speech, and why it is timeless and necessary even today. But I thought I'd go ahead and post this video clip here, along with the text of Tommy's monologue at the end of the film. He can speak for himself. Last Friday I happened to mention that I wanted to read to you three letters, written by men whose profession was not literature, but who had something sincere to say. Once I declared that harmless intention, the world began to shake, great institutions trembled, and football players descended upon me and my wife. I realized then that I was doing something important. The men whose letters I picked were Abraham Lincoln, General Sherman, and Bartolomeo Vanzetti. Originally I chose Vanzetti to show that even broken English can sometimes be very moving and eloquent. This isn't just about broken English. It's more than that! Yes sir, you've made it more than that. And Thomas de Quincey was an opium eater, and Edgar Allen Poe was a drunkard, and Karl Marx was a Communist. I'm not advocating opium or alcohol or Communism or anarchy. And if I were, you'd have a perfect right to remove me. This was supposed to be a class in English composition. And I'm saying I have a right to read any great writings, regardless of the personal habits or political opinions of their authors. And I still say it's a dangerous thing to bring up! No sir. It's a dangerous thing to keep down. And if you want to make that political, alright. I'm fighting for a teacher's rights. And a student's rights. And the rights of everybody in this land. You can't suppress ideas, Mr. Keller, just because you don't like them. Nobody can; not in this country. Not yet. This is not about Vanzetti. It's not a question of whether he was guilty or innocent. It's about us. This is a university. We're teachers, and it's our duty to be impartial, to bring what light we can into this muddled world, to try to follow truth. And if I can't read this letter today, if it must be suppressed before you've even heard what it is, tomorrow none of us will be able to read anything or teach anything except what Edward K. Keller and the Trustees permit us to teach. And you know where that leads, and where it has led in other places! We hold the fortress of free thought and free speech in this place this afternoon. And if we surrender to prejudice and dictation, then we're cowards. I don't know what started all this. I don't know quite how I got into this fight. I'm not a politician. I have nothing personally to gain by reading this letter. And there's little more that I could lose. I only know I have to read it. I can only say that I'm afraid this may disappoint many of you. It's not at all inflammatory or seditious. It might even make some of you feel a little silly. At least I hope so. Vanzetti wrote this in April 1927, just after he was condemned to die. It has been printed in newspapers, in this book, in many places. But if you should destroy every printed copy, it would still endure in the language because a great many literary people know it by heart. If it had not been for these thing, I might have live out my life talking at street corners to scorning men. I might have die, unmarked, unknown, a failure. Now we are not a failure. Never in our full life could we hope to do so much work for tolerance, for justice, for man's understanding of man, as now we do by accident. Our words -- our lives! -- our pain -- nothing! The take of our lives - the lives of a good shoemaker and a poor fish peddler -- all! That last moment belongs to us -- that agony is our triumph.